» find the max. height. In the given figure the ball of mass m is held above as shown.It is then allowed to swing freely.Find the maximum height attained by the block. Re: find the max. height. h is the height to which the ball is raised up from its hanging position. (b) the speed of the ball when the string becomes taut. (a) We have to assume that the pulley if frictionless and of negligible mass; and that the string does not stretch. Let the tension in the string be T, and the acceleration of the system (ie. both the ball and the block together) be a. I'll assume it is positive in the direction down for the block so that the system slows up and comes to momentary rest. From these two you can get a in terms of g.
(b) The ball drops a height 2h and then the string becomes taut. So you can work out its velocity just before that happens. After that the momentum is shared between the ball and the block. The velocity must be the same for both, because if the ball continued to travel faster than the block it would either impart more momentum to the block or the string would break. The block won't gain so much momentum that it travels faster than the ball. 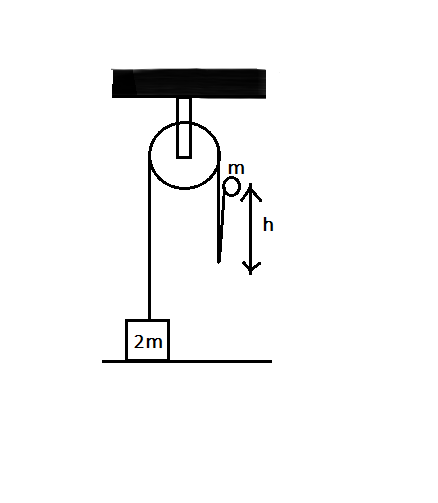 Use conservation of momentum to calculate the velocity immediately after the string becomes taut. Now you know the initial velocity of the two together, and the acceleration, so you can calculate the height to which the block rises before coming to rest.